The arid forests of Abu Dhabi are valuable but they require irrigating. Currently groundwater (GW) is the source of this water, but these subterranean reserves are being over-exploited. Law No 5 of 2016 on the regulation of GW has been passed by the Government of Abu Dhabi to reduce GW abstraction. Abu Dhabi has a supply of tertiary-treated sewage effluent (TSE) that could be used as an alternative for irrigation. We set up experiments near Madinat Zayed in the Al Dhafra region of Abu Dhabi on two arid-forest species: Al Ghaf (Prosopis cineraria) and Al Sidr (Ziziphus spina-christi). The trees were planted at 8mx 8m spacing. The TSE is significantly ‘sweeter’ than GW, as its electrical conductivity is<1 dSm−1, whereas GW is 8–10 dSm−1. The GW in this region is very high in nitrates (38.4 ± 9.2 mg-NO3 L−1), and this was not significantly different from the TSE (53.7 ± 11.8 mg-NO3 L−1). We monitored the actual tree water-use (ETc, L h−1) via heat-pulse devices in both the GW and TSE-irrigated trees. We quantified the differences in the ETc patterns for both the GW and TSEirrigated trees of both species over 3 years. Both species showed positive growth-responses to TSE, relative to the GW, and we consider this to be due to the lower electrical conductivity of the TSE water. 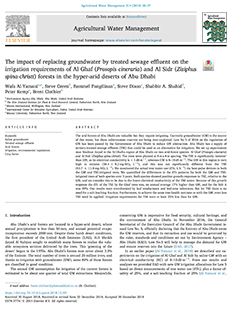 Because of this growth response the ETc of the TSE by the Ghaf trees was, on annual average 17% higher than GW, and for the Sidr it was 39%. Our results were corroborated by leaf conductance and leaf-area inferences. But for TSE there is no need for a salt-leaching fraction. Furthermore, to achieve the same tree-health outcome as with the GW, even less TSE need be applied. Irrigation requirements for TSE were at least 25% less than for GW.